Aamisha Villa is located just outside of a small Eastern Bali village, perched on a hill, with a full frontal sea vista landscape. We are approximately 250M back from the main road, the nearest seaside town of Candi dasa is just a short drive away (approximately 6KM). 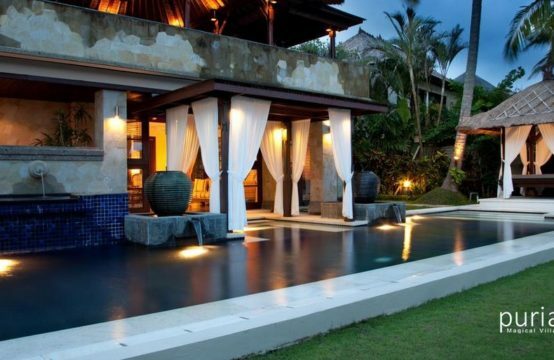 The Aamisha Villa showcases a perfect blend of high quality modern Western and local Balinese-Indonesian cultural ethos statements and ambiance. Our guests enjoy an environment in which they can unwind, relax and enjoy Bali, Indonesia in true style and comfort. Rates include exclusive use of the villa and team services including manager, butler, chef, all villa facilities and complimentary breakfast daily. 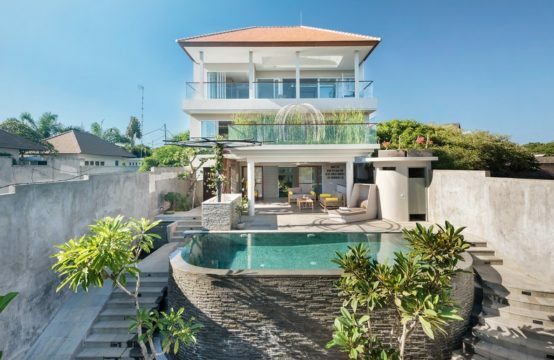 Indulge yourself in the breathtaking ocean seascape serenity, modern design features, comfort and industry best service elements of the all new private luxury accommodation retreat that is Aamisha Villa, Candidasa, Indonesia. Candidasa is a relaxing beach area close to cultural treasures like Pura Besakih ( Bali’s Mother Temple ) and Tenganan (the most famous traditional Balinese walled village). Candidasa comes from the words ‘candi’ and ‘dasa’. ‘Candi’ means temple and ‘dasa’ means ten = Place of ‘Ten Temples’. A large living room with vaulted rattan ceiling, 2nd kitchen and floor-to-ceiling windows. Large upstairs guest entertaining sun-deck area with barbecue, bar, dining area and 120 degree ocean outlook. A separate master bedroom suite pavilion with en-suite bathroom, walk-in-wardrobe and private veranda. A second bedroom with en-suite bathroom, walk-through-wardrobe and private verandah. The remaining 2 double bedrooms have their own en-suite bathrooms and walk-in-wardrobe. Timber pool decking leading to a 64m2 infinity swimming pool and child pool. Gourmet kitchen and separate staff amenities area. Large family area with home entertainment station. Landscaped tropical gardens with koi- and lotus-pond. Staff quarters including 2 bedrooms, bathroom, laundry, linen and storage areas. Generous parking facilities for 2+ cars. *All rates are inclusive government tax & service charge. Please email us if you would like to make a booking.